When you have a hair question you probably ask a curlfriend, maybe your mom or sister, or you ask on Curly Q&A. But when you're a man with long, natural hair it may not be quite as straightforward. For Tje Austin, like for many of us curlies, his fro has been a process of trial and error. 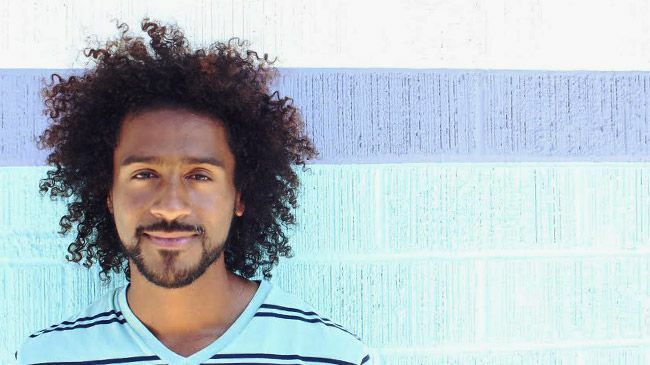 As an adopted child his parents didn't know how to care for curly hair, so Tje gathered information from friends and figured out what worked for him. He now uses the Mixed Chicks His Mix products to wash and style his hair. If you'd like to see his wash and go routine from beginning to end, watch this video we filmed! This post is sponsored by Mixed Chicks His Mix.